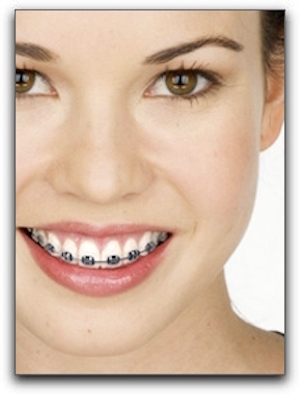 There are few dental advancements that are more appreciated than modern braces. Teeth straightening hardware of the past had many drawbacks. It often involved a whole orthodontic tool kit—full metal bands, headgear, elastics, spacers, and wires poking every which way. If you played an instrument that required the use of your mouth, well, it wasn’t easy. Some orthodontic patients found their old-school braces uncomfortable, bulky, and downright ugly. They also harbored many hidden nooks and crannies for bacteria to quietly drill into your enamel. The advancements in orthodontic treatments and minimized treatment times is one reason many adults have chosen to have their teeth aligned if they were unable as a teen. Does that mean you don’t need to have your son or daughter seen by an orthodontist if you suspect tooth alignment troubles? Absolutely not! If facial attractiveness and increased self-esteem are not critical reasons to straighten your child’s crooked teeth, consider the fact that crooked teeth and bite misalignment can impact speech development and make it hard for your child to eat a healthy diet. Crowded teeth also make proper brushing difficult, increasing the risk of dental caries. The American Association of Orthodontists counsels parents to have their child evaluated by an orthodontist when they are young. It is important to identify issues with teeth and jaw development early. Your orthodontist or pediatric dentist will know the proper age to begin treatment if necessary. We provide many cosmetic dental procedures at The Parkway Dentist in Fort Worth. Did you know that porcelain veneers can solve some less-extreme tooth alignment problems? If your teeth are fairly straight but your smile is compromised by a couple of damaged or chipped teeth, reasonably priced porcelain veneers may be your one-visit solution.